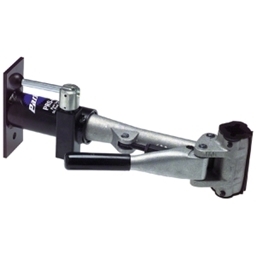 Designed to be easily mounted to any post or wall stud, the PRS-4W is a shop quality stand using the same 100-3C clamp and locking system as the PRS-2, PRS-3, and PRS-4. 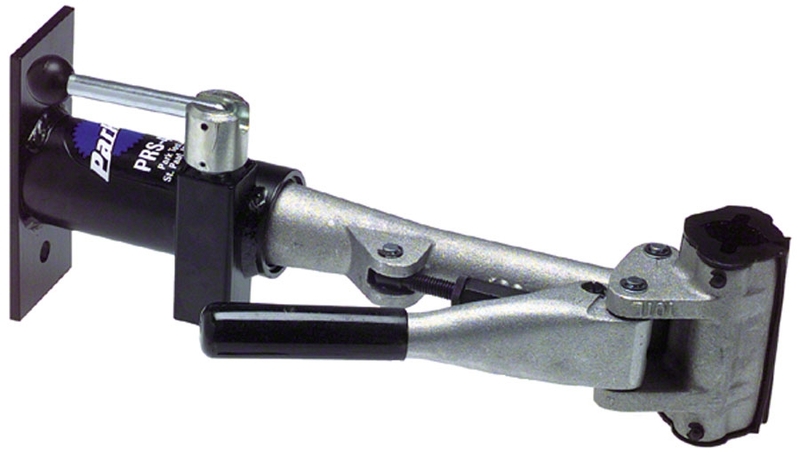 The PRS-4W places the clamp approximately 14.5 inches (37cm) from the wall. Powder coat finish. The wall mounting plate is 6 inches by 2.5 inches (approx. 15cm x 6cm). Mounting holes approximately one-half inch in diameter and are on 4-inch centers (100.2mm). Mounting bolts not included. Every biker should have one of these! I bought this mainly for my Specialized Transition Comp. as well as an array of other bikes (road, mountain, cross). Well built! Heavy duty to say the least with a grip like a vise. As long as its mounted to something firm it gives you a very stable mount to work on your bike. "It's a nota gonna moova ona you!" A bit on the pricey side but worth it. Great PRS-4W-2 ! Excellent tool ! This mount stand is of fantastic quality and super useful in tight spaces. I have mounted it on a wall in a basement, and the mount stand functions as a service stand as well as a bike hanging support. You can position the stand at any angle and attach the bike to it either at the seat post tube, or at the top tube. Excellent tool for storing the bike against the wall. Solid metal construction. No weak points whatsoever. This is heavy solid bike mount. It looks like it will last forever. Kind of expensive, BUT you get what you pay for. Modern Bike shipped it in no time. Excellent transaction. Highly recommended. Pretty heavy weight wise. That is if you have to ship it somewhere if you need it at a different location. I had to ship to Europe and postage was pretty steep because of the weight of the item being shipped. Beware of postage fees. There were mainly two aspects that have driven my purchase of this mount. To have a great bike storing mount (I like to store my bike above the ground during the winter season), and a solid support during any repairs and maintenance. Both aspects of this Mount have met my expectations. I was thinking about buying a bike folding mount but for the permanent setup this Mount can't be beat. And that's what I have been looking for. Stability and rock solid construction.